Never an easy topic to explain but one that is essential for beginners in landscape photography to understand. 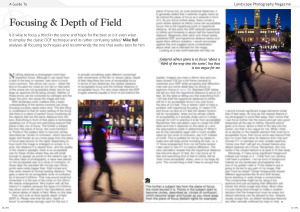 Focussing and depth of field are described in my latest Beginner’s Guide series article in Landscape Photography Magazine issue 45, out now. Hope I did it justice! Thanks Mike, I liked your article in LPM. It cleared up some questions I had always had about the ‘circle of confusion’ concept and how it was derived. One thing I did not understand in the article; early on you mentioned the standard definition used for the size of the cof as 0.033mm but the later you referred to using a smaller circle of 0.01 ‘instead of 0.025’. I could not see where the value 0.025 came from. Possibly I missed something but did you mean 0.033? Otherwise very good article which will help me think about how to achieve good front to back focussing in my landscape efforts. Thanks Howard. You have spotted a proof-reading error in my article. I gave two slightly different values for the standard figure used for circle of confusion – both should have read 0.033mm. Apologies for any confusion (circular or otherwise! ).